Red Fort Delhi's most famous monument.Built by the Mughal Emperor Shah Jahan in between 1638 A.D to 1648 A.D. 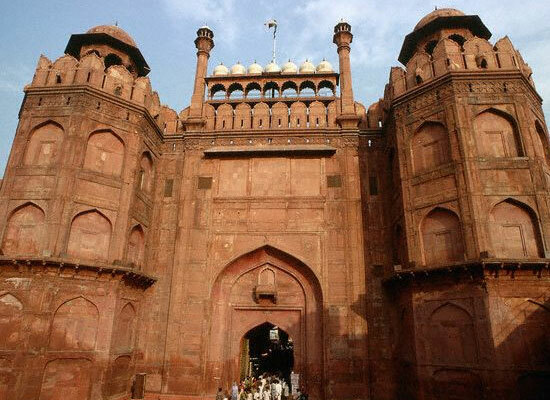 It is also called Lal Quila.The name Red Fort comes from the massive red sandstone walls that surround itThis Red sandstone fort possess grand audience halls, marble palaces, once embedded with precious stones, a market place where the royalty used to shop, a mosque, gardens with marbled fountains, plazas, baths etc. Red Fort extends over an area of about two kms and surrounded by massive wall. Originally there were 14 gates to the fort, but now only entrances have remained namely the Delhi Gate and Lahore Gate. Red Fort complex houses a number of impressive structures such as Diwan-i-Aam, Diwan-i-Khas, Rang Mahal, Khas Mahal, Moti Masjid and Royal Baths. Sound and Light Show is a modern attraction of Red Fort that is organised in the evening and recreates history of India. 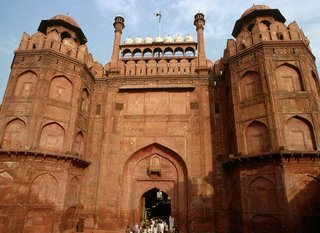 red Fort has lost most of its charm, mainly because of the traffic around Chandni Chowk area, which makes it impossible to reach Red Fort. Hope the Govt will fix the traffic some day.